It has been said that “we read best what we read most”. This quote was used as a type specimen in Emigre magazine in the late 1980’s by Zuzana Licko. It was written in defense of her typefaces, whose elemental shapes—designed with the strictures of the early HP laser printer in mind—challenged the commonly held notions of what made typefaces legible. First a question (or perhaps a Freudian jab at your subconscious): What does this shape represent? Could it be a trowel, a duck, an ornamental motif, or a seed-pod? I know, Aladdin’s Lamp! What if I told you it was an alphabetic character? What alphabet would you assign to it? Cham? Telugu? Perhaps it has the cursive quality of South Asian letterforms, created on bamboo strips (or palm leaves) and written with the pen held in one’s fist… doesn’t it? The paradigm shift—wrought by the personal computer, Postscript and desktop publishing—should have had a massive impact on the shapes of our typographic characters, just as the advances of the World Wide Web further changed the way we viewed words (even though letterforms change at the pace of the most conservative reader). 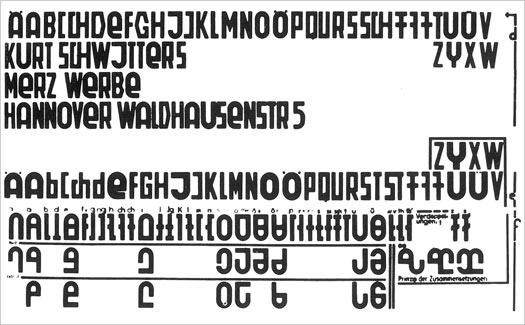 Thus, radical innovations like Kurt Schwitters’ Systemschrift, (a phoenetic alphabet from 1927), are doomed to fail. Our writing, which is derived from either Roman or Gothic forms (and sometimes both), is historic and non-systematic, said Schwitters. His “optophoenetic” approach was to make the shapes of the letters more accurately reflect how they sounded. But in order for it to work, massive re-education would be required. Kurt Schwitters’ “Systemschrift”, an attempt at developing a phoenetic alphabet. Licko was paraphrasing Sir Cyril Burt who wrote, “almost everyone reads most easily matter set up in the style and size to which he has become habituated.” (A Psychological Study of Typography, Cambridge, 1959, p. 18). So we do not necessarily respond to “beautiful” type. You may find Centaur elegant, but others will find the spiky serifs distracting. For this reason, rather dull typefaces (like Times Roman), come to dominate our graphic landscape. My purpose here is to examine some failed attempts at creating economy, or furthering the cause of legibility. For hundreds of years English was written and read in blackletter. Today we struggle with such works, such as in the piece below printed by Richard Faques at the “Sign of the Maiden’s Head” (St Paul’s Churchyard, London, 1530). The Roman character gradually supplanted blackletter in the 17th century. 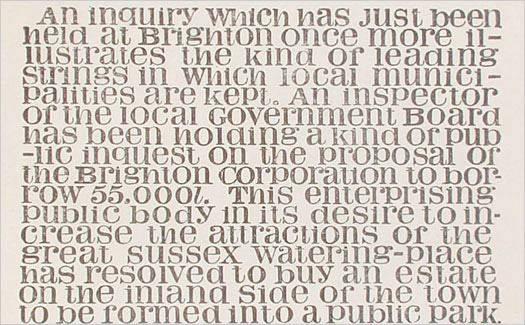 It was referred to by the English printers as White Letter, due to the lighter massed effect on the page. In the 19th century, during the period known as the Gothic Revival, blackletter was reintroduced as a novelty in English printing. Our modern Roman alphabet is a hybrid reflecting the handwriting from two periods in the development of Roman letters. It combines the Capitalis Quadratus of 1st century Roman inscriptional lettering—which are our “capital” letters—with their devolved state as manifested in the 11th century in the monasteries (that had flourished in France under Emperor Charlemagne). These became our minuscules, or lower-case letters. Charlemagne himself desired to learn to read and write, but said that “a hand accustomed to the sword could only form the simplest shapes.” By this time, war with the Arabs had cut off the supply of reeds, but relief was on the way with the introduction of papermaking (cheaper and more amenable to writing than parchment was), and goose or crow quills were substituted for reeds. These, in turn, gave way to steel pens, introduced in the 18th century (and popularized in the 1830’s), which also had a strong impact on the way we read and wrote. Copperplate scripts, learned from writing manuals, featured steeper angles and added virtuoso flourishing. Handwriting, just like music, was considered a useful art suitable for instructing young ladies. Script type based on the hand of its cutter, Robert Granjon—a wonderful example of the everyday handwriting of 16th century Protestant Europe. As letterforms were introduced by scribes, they were soon emulated by the founders of type. 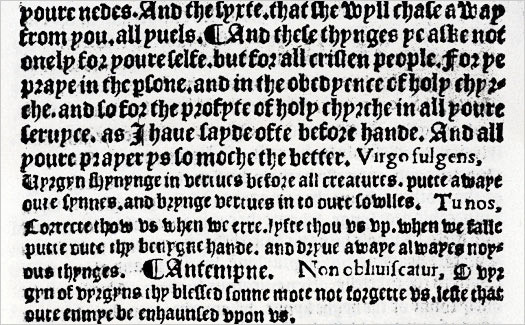 In 1557, French punch-cutter Robert Granjon cut a typeface based on his own handwriting, hoping to supplant the popularity of italics (first introduced by Aldus in a 1501 Virgil), which he himself had made widespread. His Gothic script (today called Civilité, after the children’s conduct book in which it was used) unfortunately did not catch on, although it accurately reflected the everyday handwriting in Protestant Europe at the time. — Translated by Harry Carter, in Carter & H. D. L. Vervliet, Civilité Type, Oxford, 1966, p. 16. Roman letterforms evolve slowly, gradually reflecting the medium in which they are written. 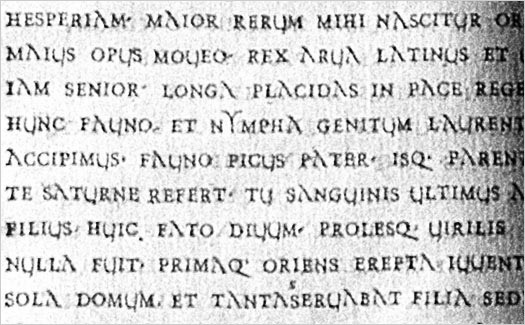 The Rustic letterforms of the ancient Romans, often written with a stylus on a wax tablet, were fluid and more condensed than the capitalis quadratus, but less cursive than letters written in ink with a reed (on parchment or papyrus). 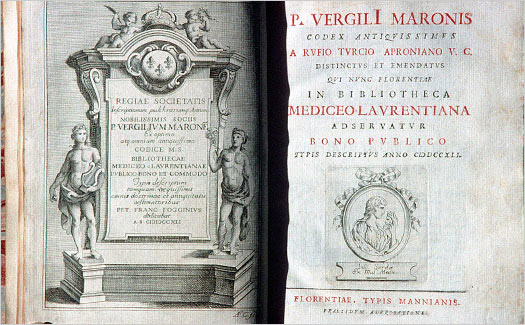 In 1741, Joseph Manni, a Florentine printer (and the first of our misguided visionaries) produced a unique edition of Virgil based on a manuscript of the poems (Codex antiquissimus) found in the Medici Laurentian library. 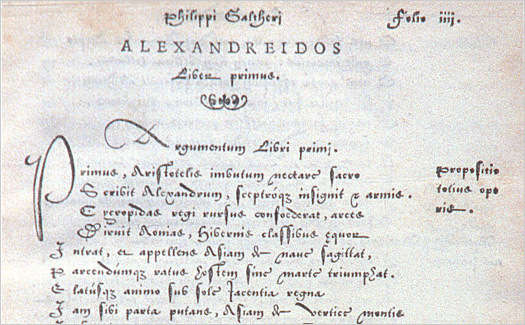 Florentine printer Manni cut new versions of A, U & Y to evoke a 1st century manuscript. 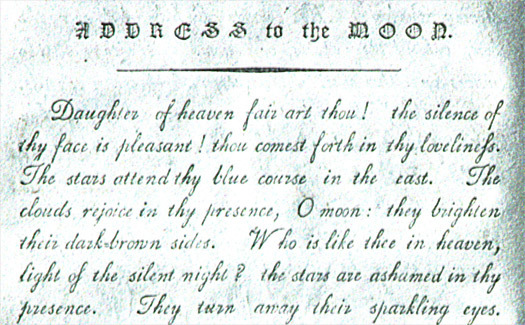 A later typographic copy of a manuscript form was made perhaps by Joseph Jackson, a former apprentice at the celebrated Caslon foundry whose work was acquired by them after his death. Talbot Baines Reed’s assessment of this script type is that it “is of no particular merit though faithfully enough rendering the contemporary clerkish hand.” (A History of the Old English Letter Foundries, 1952 Edition, Faber & Faber, p. 245). The type had to be heavily kerned (which caused frequent breakage, as it was cast on angular bodies) might work in some contexts, such as a circular letter, or brief documents intended to look hand-written. But it certainly did not work for continuous text. 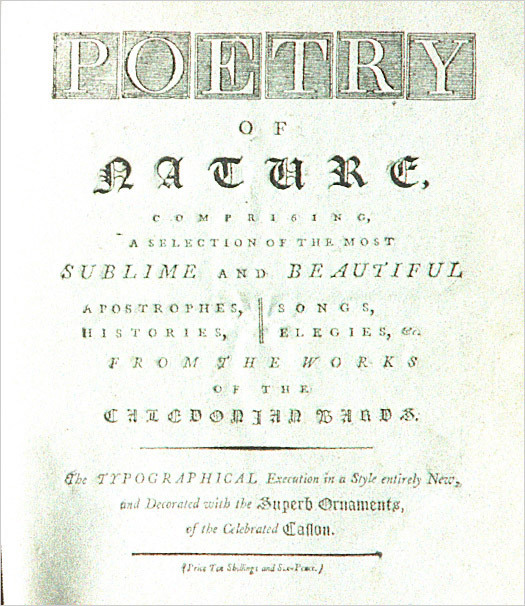 Nevertheless, that was how it was put to use by J. P. Cooke, a London printer, in his edition of Mary Potter’s Poetry of Nature (1789). The poems are in fact prose reworkings from the legendary Highland Bard Ossian, hailed as “The Scottish Homer”, but who was actually a fabrication of the poet James MacPherson. Cooke added titles in blackletter capitals to really confound his readers. The decorative qualities of the blackletter caps work well individually with the plainer lowercase letters, but when grouped together, all-cap titles in blackletter become a tangle of confusion. The copperplate script, however, was popular with founders (less so with printers, because of the breakage) and was still being manufactured up until the mid-19th century. Troublesome script typeface in use in 1789: as it had to be heavily kerned this led to frequent breakage. 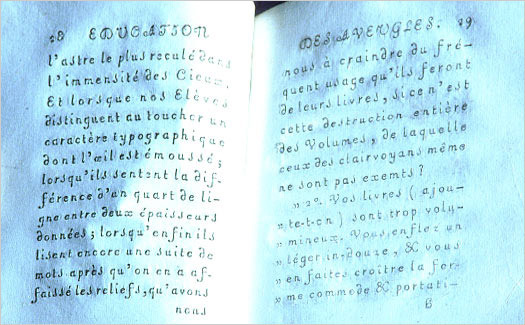 Before Louis Braille (1829) there were several attempts to devise a raised letterform to teach the blind to read. Valentin Haüy met Baroness Von Paradis in 1780 and “was surprised to find in her apartments several contrivances for the instruction of the blind; for instance, embroidered maps, and a pocket printing apparatus.” (Charles Timperley’s Encyclopedia of Literary & Typographical Anecdote, London, Henry G. Bohn, 1842, p. 751). Haüy’s Essai sur l’Education des Aveugles (Paris, 1786) was a strange effort. Printed by Clousier, printer to Louis XVI (the last King of France), the book was typeset by blind children as part of Haüy’s plan to allow them to be a useful part of society, by having them set and print work for themselves to read. His fundamental blunder was he approached the problem from the angle of a sighted person, assuming that conventional alphabets offered the best hope. The highly decorative, non-kerning, upright script form he chose (popular in France at the time) would impede even the nimblest reading fingers. In the printed version the letter-spacing and swash cap headers also would slow you down. One minor benefit to the compositors was that since the work was produced by embossing, the young typesetters worked with right-reading types. OK, remember our quiz? Here are two more clues… what are these: Ladies’ shoes, or just squiggles? Like Manni’s attempt, economy of method was the tool employed by Philip Rusher, who also falls into our “misguided visionary” category. He proposed to save space, and thereby paper, by eliminating descenders, since only five letters in our alphabet—g j p q y—have them. 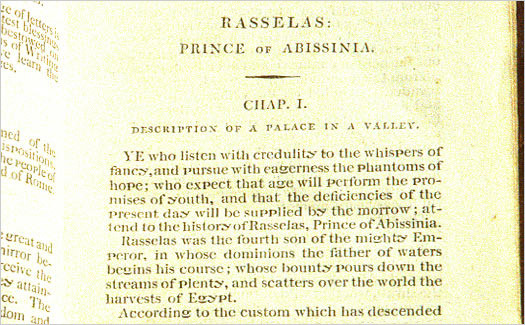 But he made a serious tactical error; to demonstrate his new type he chose to reprint a popular novel, Samuel Johnson’s Rasselas, Prince of Abissinia (Banbury, 1804). Apart from the fact that it is an unremittingly dull story with little incident and a dim grasp of locale, most of the story is set in Egypt—and that word, with its three descending letters in an awkward huddle, pops up frequently. The type was later used by Rusher’s nephew in 1852. Rusher even obtained a patent for “various improvements and alterations in the form of printing types … so as to diminish the trouble and expense of printing, and to render it more uniform and beautiful.” But clearly they were anything but uniform and beautiful. The letters g, y and p are found in an awkward huddle. 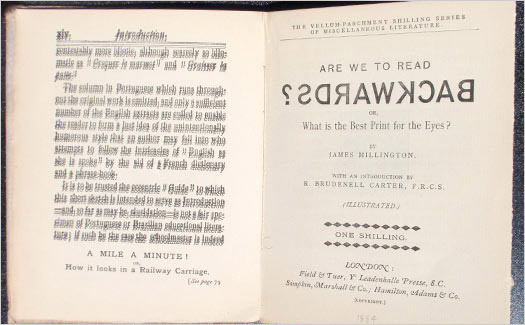 An early, somewhat tongue-in-cheek, study of legibility is James Millington’s Are We to Read Backwards? This book was published by the remarkable Leadenhall Press of London (1884). The press was run by Andrew W. Tuer, an antiquarian who also enjoyed the look of old books, so his typography is quite anachronistic for that time period. However, there is a great printer’s jest in his frontispiece which shows how books look in a railway carriage as the reader is bounced & rattled along (The frontispiece is from Millington’s introduction to English as She is Spoke, published by Field & Tuer the year before—a French-Portuguese phrase book, translated into English with a French dictionary!). A printer’s joke—the page on the left simulating the reading-on-the-train experience. Several “improved” alphabets are shown. 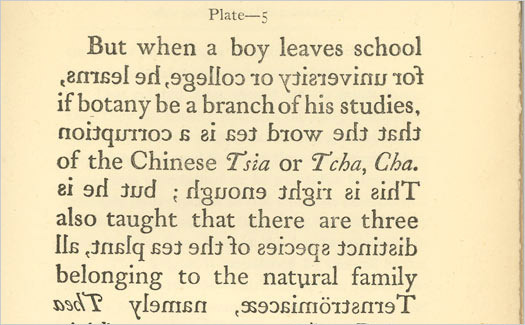 Plate 5 (as shown below) is boustrophedon type, which would save eye movement in reading, but caused brain strain as well as posed problems for typesetters when they had to fix an error. Plate 7 (with no ascenders or descenders, to save space), has an almost folkloric quality to it, suggesting lettering done by amateurs. An attempt to reduce eye-movement resulted in more problems than it solved. A typeface lacking ascenders & descenders creates a visual jumble. Non-professional lettering is a common source for experimental alphabets. In the 1930’s the American artist Ben Shahn was documenting The Great Depression in the rural South for the Farm Security Administration. He adapted the primitive signs he’d photographed to create his own distinctive letter-forms, seen in posters and dust-jacket designs. These in turn have been digitized into the FF Folk typeface family by Maurizio Osti in 1995 (below right). There is a problem with the typographic adaptations of quirky lettering, and that is each character is always going to look the same. When two or three “O”s appear in close proximity, they tend to become monotonous. An artist will vary letter-forms, not just to avoid predictability, but to make pairings work better together. Even without numerals, Granjon cut 138 sorts for his first Civilité type seen earlier in this article. FF Folk has two versions for each letter, and three weights to obviate the problem. 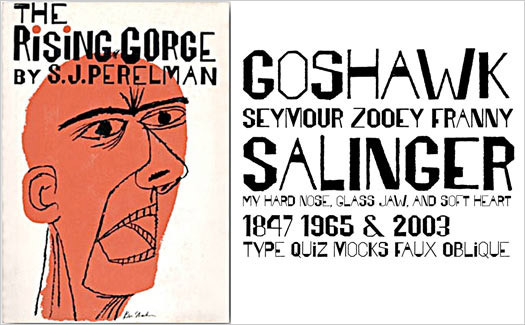 Ben Shahn dustjacket, inspired by Southern US folk signs, and a modern typeface based on Shahn’s lettering. But let’s go back to our riddle. The answer is, if you haven’t guessed already, the letters “e,” “n” and “r” in Hoyt Script. Handwriting flourished—no pun intended—in the 19th century, before the perfection of a new gadget called the typewriter (1873). And people experimented with different nibs, including one called the stub-pen, whose effect was as blunt as it sounds. Simultaneously, a major change was underway in the production of typefaces. Having learned how to grow matrices from a cast character or piece of type (to pirate typefaces), the ingenious Americans soon discovered that instead of cutting steel punches, they could simply carve a character out of a piece of soft type-metal. This created an electrotype matrix, taking hours out of the laborious process. Typeface production accelerated, and there would be a boom in the 1880’s for the introduction of new types. James West adapted these optimized methods of production. He worked for many founders in his career, including Miller & Richard (in his native Edinburgh), Caslon and Figgins (in London), and George Bruce (in New York). In the 1880’s he worked for the Cleveland typefoundry and cut many scripts with intricate connecting strokes for them, beginning with Carpenter Script, based on the handwriting of a “Mr. Carpenter” (who worked for Robert Hoe & Company, the press manufacturer). Released in 1883, the letters of Hoyt Script are individually unreadable, but when brought together are lively and overflowing with personality. This script was so popular that Cleveland induced West to cut more scripts, and Hoyt Script was patented in February, 1883. 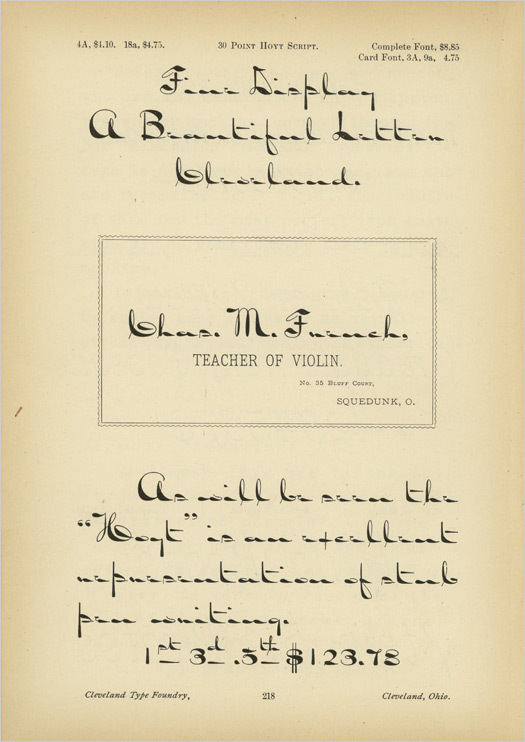 It’s seen here above in Cleveland’s 1883 specimen book, where as you perhaps can see, it’s recommended as “an excellent representation of stub-pen writing.” Individually the characters are completely unreadable, but en masse, they create a unique and lively typeface, overflowing with personality. Ideal for selling ladies’ shoes, Aladdin’s lamps, or whatever you fancy. Note: Granjon, Manni, Potter, Haüy & Rusher books are reproduced courtesy of the Robert Grabhorn Collection on the History of Printing & Development of the Book at San Francisco Public Library. All other images from the author himself. Editor’s Note: A big thank you to our fabulous Typography editor, Alexander Charchar, for preparing this article.